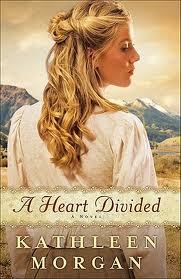 A Heart Divided is a wonderful story of Sarah Caldwell and Cord Wainwright. Each raised by fathers who were feuding long before either of them were born, yet both expected to carry on the family tradition of vengeance against the other. Feeling a strong sense of devotion to their own families, while longing to rid themselves of the bitterness that is destroying those they love, can they ever leave the past behind and move to a happier future? Kathleen Morgan did an excellent job in showing both sides of the story. I found myself struggling right along with the characters as they were torn between honoring family wishes, or choosing to forgive and trust God. I had a hard time putting the book down as I went from supporting one family and then the other. It was truly filled with emotion as the story played out. I enjoyed the supporting characters as well. A great mix that rounded out the story. Romance, love, faith, and forgiveness... even a little action and mystery. This is the first book in the Heart of the Rockies series. You won't be disappointed. I can't wait to read the next one! It thoroughly enjoy book reviews, though I rarely purchase reviewed books - - mostly because I have a pile of them I'm still working my way through. I love them all, and I'm sure I'd love this one too!!!! And yes... I think you'd love this one too!